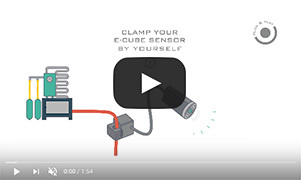 The E-Cube sensor is powered by the electricity that travels through your machine’s phase wire. The sensor measures the energy used by your machine, stores the data, and then transmits it by radiofrequency to the E-Access receiver in your kit. E-Access gathers data from all of your E-Cubes (within a recommended radius of 30 meters) by radiofrequency. The E-Log data logger sends your data to the Save-It-Yourself.com platform by radiofrequency (via GPRS with a multi-operator SIM card). Save-It-Yourself.com cleans, saves, and processes your data so that you can monitor your energy consumption simply. Analyze where energy is going, machine by machine, so that you can improve your standby and shutdown strategies. If you are ISO 50001 certified or planning to become certified, the kit can help! Monitor and improve your energy performance in compliance with the 2018 standard. Tracking your energy consumption trends and generating reports has never been easier! The kit is designed to make your life easier, from implementation to operation. It takes less than five minutes to install the wireless sensors, and you don’t even need to shut your machines down to do it. Plus, you get the total peace-of-mind that your data is secure. You can expand the products in the E-Case kit with E-Cube power sensors and a whole range of compatible sensors to measure temperature, CO2, moisture, and more. The kit is so effective that it can save you 5% to 12% off your energy bills right away. For every €100,000 in electricity bills, one E-Case pays for itself within just one year. Shift your plants to Industry 4.0 today by gathering and monitoring your energy consumption data automatically. Do you need help installing your sensors?